Thanks to Chuck at tdr250.org for allowing us the use of this page. With the TDR, Yamaha create a totally new category in motorcycling. Powered by a two-stroke parallel-twin engine with YPVS and "cross-up" exhaust system, the TDR boosts instant acceleration far exceeding that of normal dual-purpose machines. 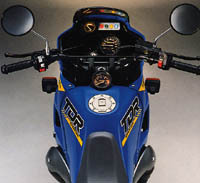 The TDR is also the world's first two-stroke bike to use a CD ignition with digital advance system. Nimble handling and stunning acceleration for street use are combined with unmatched off-road capabilities, thanks to sturdy front forks, the rising-rate Monocross rear suspension, and front and rear disc brakes. And as for looks, a tank-mounted head fairing rounds out the TDR's unique styling theme. The 250cc class will never again be the same. sports and delivered 50 HP. While essentially a TZR 25O unit, a variety of modifications have been made to better suit engine power delivery with intended use. Lowered first gear ratio (45/14 against the TZR 25O's 4 1/14) dramatically improves acceleration while increasing off-road traction. Power is transmitted to the rear wheel via a sealed, continuous-link chain for high durability and low maintenance. The newly designed "cross-up" exhaust System, featuring "satellite-chrome" plated silencers, is tuned for low- and mid-range power. It ensures plenty of ground clearance and free rider movement. The 28 mm flat-slide carburettors have been re-jetted to match the different breathing requirements of the new pipe and air box. 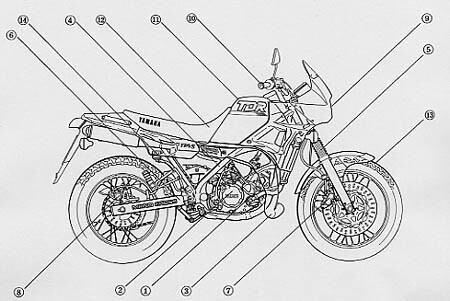 The TDR is the world's first motorcycle to combine a CD ignition with a digital timing advance system. Controlled by a 4-bit microprocessor, it ensures perfect ignition timing at all rpm. The microcomputer also serves as a control unit for the YPVS and side-stand switch, contributing to savings in weight and space. ensured some off-road capability too. Fabricated of high-tensile steel tubes, the double-cradle frame features high strength and low weight. Both the top and down tubes are narrowly spaced near the steering head to permit a wide steering angle, and extensive gusseting are used at this point for increased rigidity. Tapered roller bearings are used at the steering head for increased durability and reduced flexing. Cast-aluminium passenger footrest brackets are mounted on the rear sub-frame. An air-assisted, centre-axle front fork uses stiff 38 mm stanchions. A steep 27-degree castor angle and 114 mm of trail contribute to the TDR's short wheelbase and quick-handling characteristics. Front wheel travel is 160 mm. The fork is adjustable for air pressure and spring pre-load, and is fitted with rubber gaiters to protect the tubes from debris. The rising-rate Monocross rear Suspension system features a De Carbon-type gas/oil shock absorber with separate reservoir operated by a box-section swinging arm of high-tensile steel. Rear wheel travel is 150 mm. The TDR uses front and rear disc brakes. The front disc is a 320 mm floating unit operated by a 4-pot, opposed-piston calliper, while a 210 mm disc with opposed-piston calliper is used at the rear (the discs are same as the TZR's). The 18-inch front and 17-inch rear spoked wheels have light aluminium rims and will be fitted with either Metzeler Enduro 3 Sahara or Bridgestone Trail Wing tyres for good traction on both tarmac and dirt. The low front fender directs cooling air to the radiator. The Yamaha TDR - adding a new dimension to the already exciting field of sport riding. 1) 2-stroke, 249 cc, liquid-cooled, crankcase reed-valve, parallel twin-cylinder engine. 2) Capacitor discharge ignition with microcomputer-controlled, digital timing advance System. 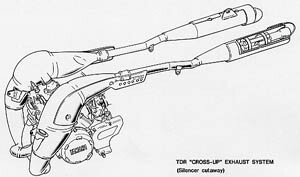 3) "Cross-up" exhaust system featuring satellite -chromed silencers. 4) Light' strong double-cradle frame fabricated of high-tensile steel tubes. Tapered roller bearings are used at the steering head. 5) Sturdy 38 mm front fork is adjustable for air pressure and spring pre-load. Provides 160 mm of wheel travel. 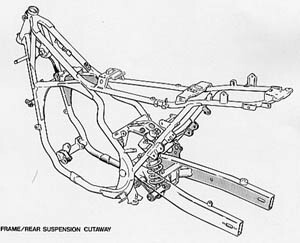 6) Rising-rate Monocross rear suspension uses a De Carbon-type gas/oil damper and a box-section, high-tensile steel swinging arm. Rear wheel travel is 150 mm. 7) A drilled, 320 mm front disc stopped by a 4-pot, opposed-piston calliper. The rotor is floating for precise control. 8) The rear brake consists of a drilled, 210 mm disc and an opposed-piston calliper. 9) Stylish head fairing is mounted to the petrol tank for nimble handling. lt houses a powerful 60/55W halogen headlamp. 10) Simplified instrument panel features tank-- mounted tachometer for easy reading. 11) The tank holds 14 litres of petrol and uses an aircraft-style filler cap and a negative pressure activated tap. 12) Roomy' deeply padded seat is 820 mm from the ground. Separate passenger grab bars are fitted to the tail cowl. The oil tank, air filter, tool and glove boxes are situated beneath the seat. 13) 18" front and 17" rear spoked wheels have aluminium rims, and are shod with Metzeler or Bridgestone high-grip tyres. Low front fender helps cooling efficiency. 14) Lightweight cast-aluminium pillion footrest brackets.